Would you know what to do to keep your pet safe in the event of a natural disaster? None of us want to think about a natural disaster or emergency situation striking our family, but if and when a crisis does occur, it’s best to be prepared as possible to safely and calmly get through the situation. Since our pets are beloved members of our family, it’s only natural that we also be ready to help them through an emergency as well. As shown below in this awesome infographic by the ASPCA, many people do not know how to properly act during a natural disaster, sometimes putting their personal safety at risk because there is no plan in place. 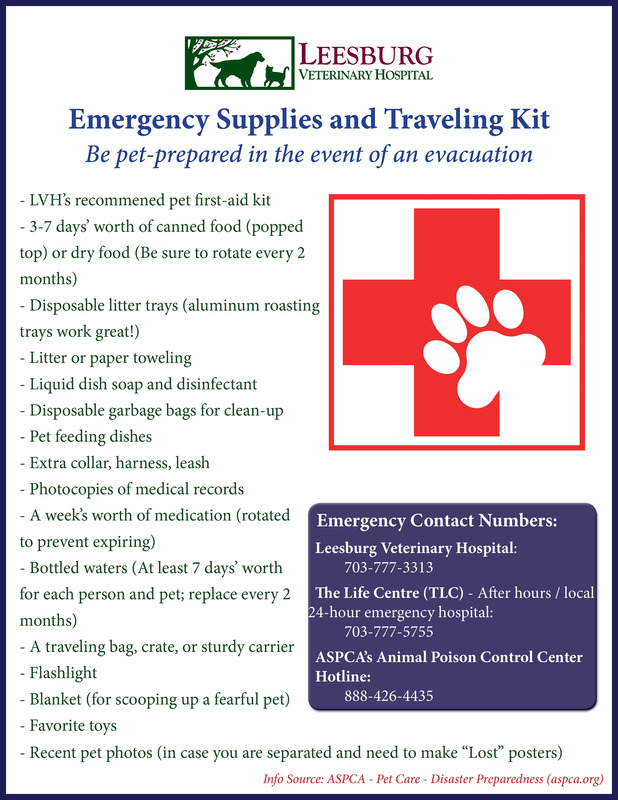 As outlined in this infographic, there are many ways to easily prepare for emergencies – such as making sure your pet is microchipped, creating a pet first kit and traveling pack , and having an evacuation plan in place. Below you’ll find some of our tips and best practices for being pet prepared in emergency or natural disaster situations. 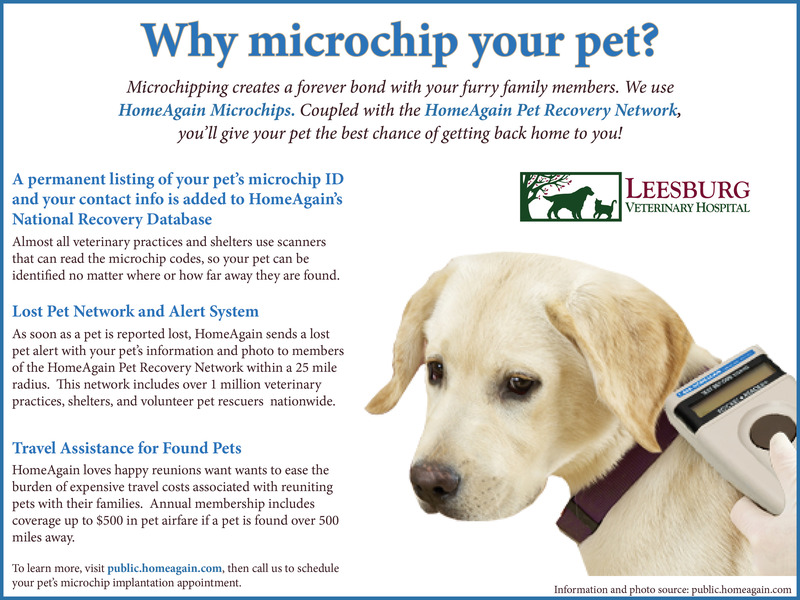 The only permanent and most effective form of identification in the event that your pet goes missing is a microchip. A microchip is a small, implantable computer chip that contains a unique identification number. The chip is about the size of a grain of rice (12 mm) and is implanted beneath the surface of your pet’s skin between the shoulder blades. The implantation process is fast and painless and can be done at any office visit. In fact, it’s very similar to getting a routine vaccination. Once your pet is microchipped, he or she has a permanent ID for life. For a greater insight into the importance of microchips and why we recommend them for ALL of our patients (including indoor cats), read our blog article here. In the event that a pet should go missing during an emergency or natural disaster scenario, a microchip is the most effective way of returning lost pets to loved ones. Every pet owner should have a basic first aid kit on hand at home or when traveling with your pet to help you deal with a medical emergency. Sometimes the easiest way to create a pet first aid kit is to buy a human kit and build on it with pet-specific items. Here’s our list of recommended items to include in your pet’s first aid kit. Don’t forget to include any medical-related items or medications related to your pet’s specific needs. And remember, any first aid administered to your pet should be followed by immediate veterinary care. First aid care is not a substitute for veterinary care, but it may save your pet’s life until they receive veterinary treatment. 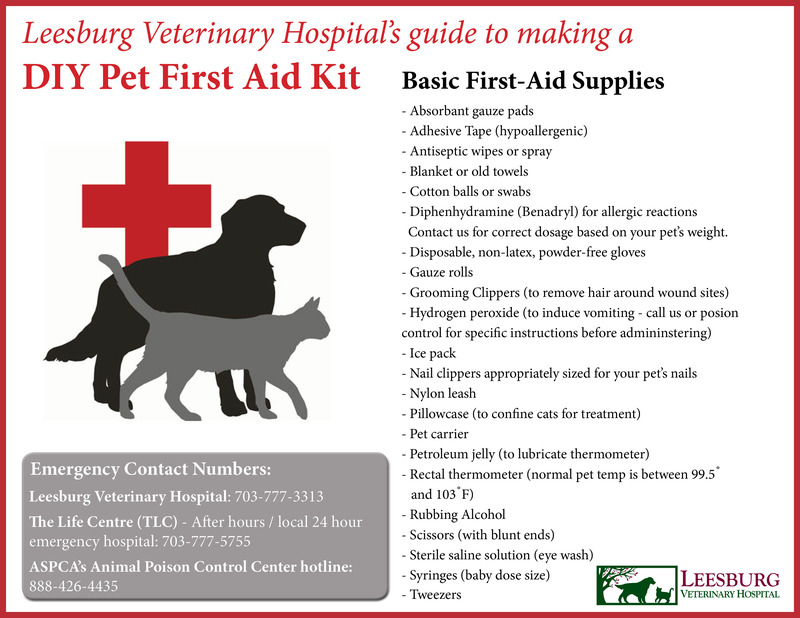 Every pet owner should have a basic first aid kit on hand at home or when traveling with pets. Don’t forget to include any medical-related items or medicine related to your pet’s specific needs. We also recommend gathering supplies for an evacuation kit. We loved the list of supplies provided by the ASPCA in their disaster preparedness article. Keep this kit in a convenient location (the garage or closet near the door) to easily grab if you need to leave your house in a hurry. And don’t forget to rotate perishable items (like food, water, medications) to prevent them from going bad or being useless when you really need them. Download and print a copy of our emergency supplies and traveling kit. Equally important to making pet traveling/evacuation plans, is ensuring your pet is safe when they are left alone at home or in the event of a house fire. Simple things like pet-proofing your home, practicing fire escape routes, and alerting rescuers to your pet’s presence with monitored smoke detectors and window clings can make all the difference to keeping your pet safe at home. For more information and ways to pet proof your home from house fires, visit the American Kennel Club’s site. 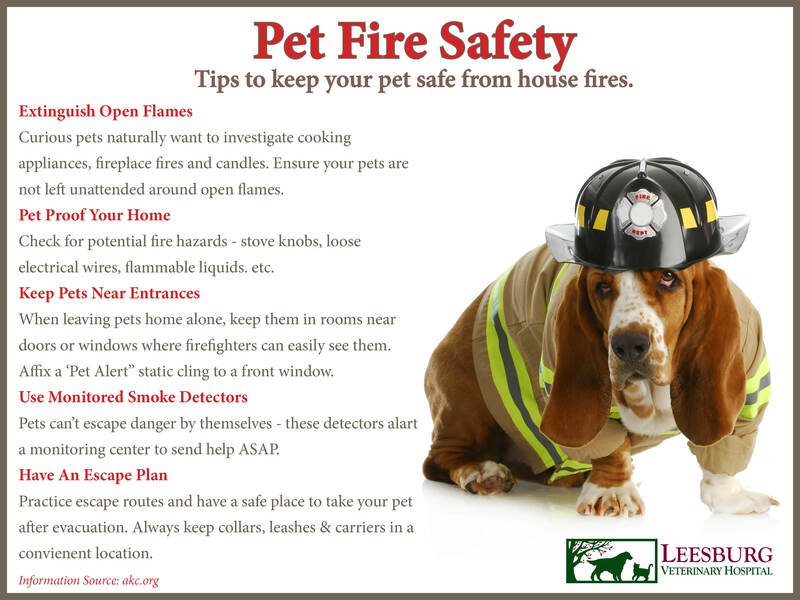 Is your home pet-proofed and ready for a house fire? Follow these tips from The American Kennel Club. It is also important for every pet owner to know some basic pet first aid and triage techniques. Sometimes accidents happen – especially during the craze of an emergency or natural disaster – and being prepared can make all the difference in saving your pet’s life before veterinary assistance is available. The image below outlines some of the Red Cross’ pet first aid tips and common symptoms to look for. (This information can also be found on the Red Cross’ website here.). For even more information on pet first aid and emergency preparedness tips, visit our Pinterest page.